Pentair Lube Free valves have excellent flow characteristics and are manufactured to strict quality standards. And, as the name says, they never require lubrication. Constructed of durable PVC, they provide a lifetime of superior performance at a great price. 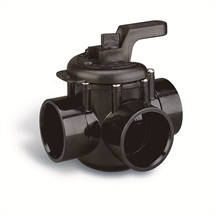 All of our valves are easily installed and simple to use. When paired with our valve actuators, they're the perfect solution for fully automated operation. FEATURES •	Made of durable PVC •	Maintenance-free PTFE coated diverter seal •	Optimum positive-seal •	High Flow Rate • Fiberglass reinforced handle • Withstands pressure up to 150 psi • Chemical-resistant •	Used for diverting, shut-off or mixing applications • Accepts 1 1/2 in., 2 in., and 2 1/2 in. PVC plumbing •	Field-adjustable stop positions •	Plumbed with inlet at any port •	Designed to work with most industry standard actuators. Ship weight 2 lbs.